Check out our large inventory of gooseneck trailers and pintle hitch trailers. PJ, Loadtrail, Diamond C, Eby aluminum goosenecks all in stock! Check out the Diamond C Engineered Beam Gooseneck trailers! 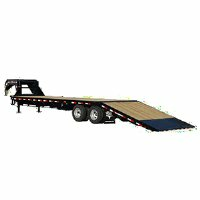 We are the LARGEST stocking dealer of Diamond C Fleetneck Engineered I-Beam Gooseneck trailers in the Midwest. LIGHTER, STRONGER, TALLER I-BEAM AND A NICE ARCH IN THE FRAME MAKE THE IT THE BEST GOOSENECK ON THE MARKET TODAY! A 40’ Diamond C Engineered beam gooseneck trailer is 900 lbs. lighter than a comparable PJ or Loadtrail gooseneck trailer. A DIAMOND C 40' HOTSHOT TRAILER WITH HUTCH SUSPENSION, 17.5" TIRES, DISC BRAKES, 12K AXLES, MAX RAMPS, 2 SPEED JACKS, AND SPARE TIRE WEIGHS 9,880 LBS!!!!! Browse these categories under "Gooseneck Trailers and Pintle Hitch Trailers"
Featured products under "Gooseneck Trailers and Pintle Hitch Trailers"